The average man has about 2 grams of iron in his blood cells at any given time (women have about 1.6 grams). If the dietary iron intake falls below daily needs and this storage amount goes down, the ability to tolerate bursts of exercise will deteriorate. The reduction in blood count related to having low iron stores (or other nutrient deficiencies, including of vitamin B12, folate, copper, and vitamin A) is called anemia. In addition to the key role iron plays in transporting oxygen to tissues, it also is necessary to support proper metabolism for muscles and other active organs. Almost all of the cells in our body burn dietary calories to create energy through a process that requires iron. When iron stores get low, this process gets compromised, and generalized fatigue can occur. Copper is necessary to mobilize iron from storage for use in blood cells and other areas. Because of this, deficiency of copper may play a role in anemia. For most people, the checks and balances on iron absorption and excretion keep our body stores in a fairly narrow range. This is a good thing, as too much stored iron can help to foster free radical damage to the liver and other organs. Although iron is part of the antioxidant enzyme catalase, iron is not generally considered an antioxidant, because too much iron can cause oxidative damage. Because of this, one should not take iron supplementation unless you have an iron deficiency. Who is likely to be deficient? Vegetarians eat less iron than non-vegetarians, and the iron they eat is somewhat less absorbable. As a result, vegetarians are more likely to have reduced iron stores. However, iron deficiency is not usually caused by a lack of iron in the diet alone. An underlying cause, such as iron loss in menstrual blood, often exists. Pregnant women, marathon runners, people who take Sspirin, and those who have parasitic infections, hemorrhoids, ulcers, ulcerative colitis, Crohn’s disease, gastrointestinal cancers, or other conditions that cause blood loss or malabsorption are likely to become deficient. Like crystals, metals have their unique nature and elemental energy. It is powerful and wonderful to work with metals. Iron has a very strong fire element which corresponds to Mars. The core of our Earth is also of molten iron. So, iron powerfully grounds and anchors us to the Earth. Citrine also has a strong fire element and iron pyrite also has a strong fire element. But, the fire element of iron is completely different. The elemental energy of crystals feel like a wave of light and the elemental energy of metals feel like a rush of flowing water, more tangible. If one is sensitive to the energy, feeling the energy of metals will be a very easy task. Though both Iron and Steel are said to correspond to the planet Mars, steel which is not much attracted to a magnet has a different nature. Iron is more powerful and the fire is raw and hot. Steel seems to have more earth and less fire. Fire element has the ability to protect, energize and makes one very self confident and strong. Especially those who are ruled by water element, astrologically, may feel comforted by the fire element at tough times. It applies in general for sensitive individuals. It is a projective and protective elemental energy. If there is too much of emotional turmoil, fire element shall stabilize it immediately. Also, those who are affected by the phases of moon, emotionally, will find the fire element very comforting. Also, it strengthens the body and improves health. Our blood has heme, the ferrous component.. It adds fire to the whole of the being. Iron has been used in many cultures. The horse shoe of iron is considered to be protective and people hanged it on their doors. Some make rings from the horse shoe metal and wear it. It is just the metal that matters and not the form. When it is close to the body, within the aura, it works beautifully. A person who has excess Iron is hard, strong, active and assertive - an 'Iron Man'. It is the masculine metal that will fight or argue if pushed, or even without pushing. They make decisions quickly, they speak abruptly and forthrightly, they move quickly and are always busy, moving on to new things. They gravitate naturally to military, metal-working, butchering and police matters where they find others of their own kind and a job they thoroughly enjoy. They think on the hoof, rarely reflecting on what they do. They are activity centred, spending most of their time fully occupied. They like sports of all kinds. Many business people fall also into this category. They are accused of being hard, selfish and aggressive. Some incline to violence or criminality. Iron is softened, domesticated and improved with silver, copper or gold. The iron type needs to be less assertive and more kind, needs to be mellowed and made more passive and receptive to others' needs. Nux vom and Coffea types abound here. Also Sulphur and Ferrum met. This is made from 10ppm Colloidal Iron as a base. Then I preformed the John Hudson method by adding Organic Dolomite and swinging the PH. 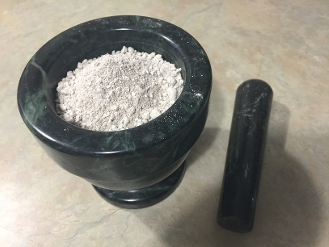 Then after washing it 7 times and drying it out, it is now a fine white Ormus powder that is extrememly high in Iron.